← What a great day!! Another long day and I am wiped out!! Lots of driving today to take in several sights and to meet with a couple special people. Ten of us set out in two vehicles early this morning and drove to the lowest place on earth, the baptismal site of Yeshua on the north end of the Dead Sea. This was our second descent from Jerusalem to the Dead Sea on this trip and our ears popped just as much as we watch stunning early morning fog and sun dance on the Jordan ridge as we sped downhill. The Baptismal site was not over done as many of the tourist sites are (which is why I avoid a ton of them…). It was surrounded by nearly a half dozen Catholic churches or monasteries and had the gun toting Jordanian guard across the rive, er creek, a scant 30 yards away. As group we took time to pray for the return of the Moshiach from the east as prophesied and prayed for the second entry into the Land as a culmination of the Second Exodus. Several went into the dirty water and I just thought about Naaman. LOL! We headed up 90 from there paralleling the Jordan until we reached the base of the Knerret, or Galilee. Our only hiccup was nearly being separated from Marie, driving the lead vehicle, at the check point as we re-entered Israel from the contested territory. After creeping our way around the west side of the Knerret and through Tiberius due to thick holiday traffic, we went to a fairly new excavation, Magdala Park. Seems the Catholics are trying to monetize that site, too. The excavations of Mary Magdalan’s home town were very interesting, but the hotel and conference center wrapping around and sitting over unexcavated parts of the town was a bit off putting. After the park we found a secluded spot for a picnic lunch before taking in Capernaum, a site I have seen a couple times. We happened to be in the synagogue at 3pm and sang the Shema from there. Next, several of our group wanted to put their feet in the Galilee so we scrambled down the rocks to the water’s edge. I was amazed at how much lower the level was from the last time I saw it… Several meters lower!! 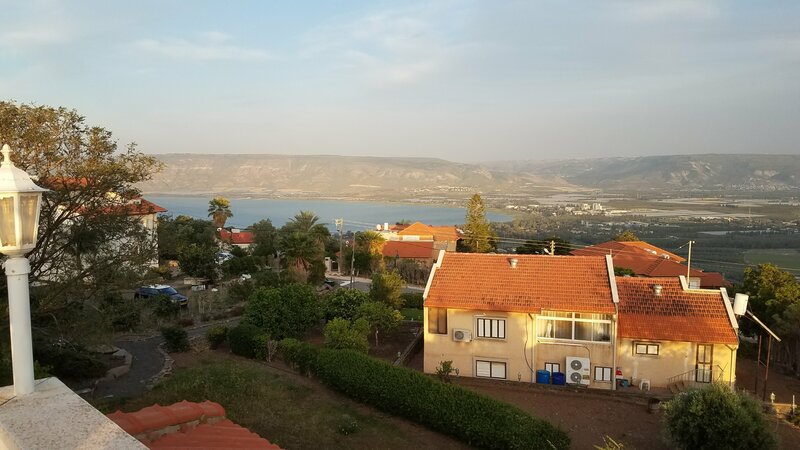 We headed back toward Tiberius and found Avigail’s beautiful first floor, four bedroom apartment overlooking the Knerret. Stunning views!! She does not have an official B&B, but uses her gift of hospitality to host many, many who come through her door. Recommended donation is 170NIS per person per night and I can tell you, that is a deal! Her home was so filled with shalom and she truly has a call to the Ephramite people! She had a spread of dates, pistachios, tea, wine, and fruits when we arrived. We had to leave much too soon… Pics below. I’ll post more details and contact info in a future post, but you can email me if you need it sooner. After Avigail’s we wound our way out of town toward Poriea to the Bed and Breakfast owned by Carolyn and Richard Hyde. Richard had to be away to tend to family business, but we enjoyed a time of fellowship and worship before a tasty dinner put together by Carolyn. The view of the Jordan valley and southern tip of the Knerret from multiple vantage points in the house was quite nice. After warm conversation we headed into the night to drive back to Gi’vat Ye’arim. Long day, many miles, but beautiful and satisfying. I will be weeks processing all we have seen, heard and learned, not to mention the many great new connections. Aslan is on the move! 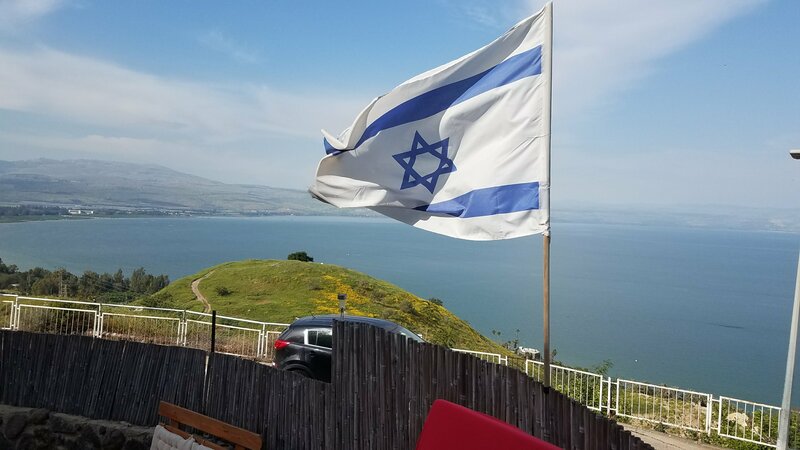 This entry was posted in B'Ney Yosef Congress, Travel and tagged Avigail Varon, baptism, bed and breakfast, Galilee, Jordan River, Tiberius. Bookmark the permalink. Thanks for sharing all the great info and pics! My maiden name was Wilson…James A. was my pappa. He died 13 years ago today in WI. I have been living in Israel for many years. So glad you were able to go to the baptismal site! We visited from the Jordanian side, and were impressed with the archaeological and historical documentation supporting the site’s validity. 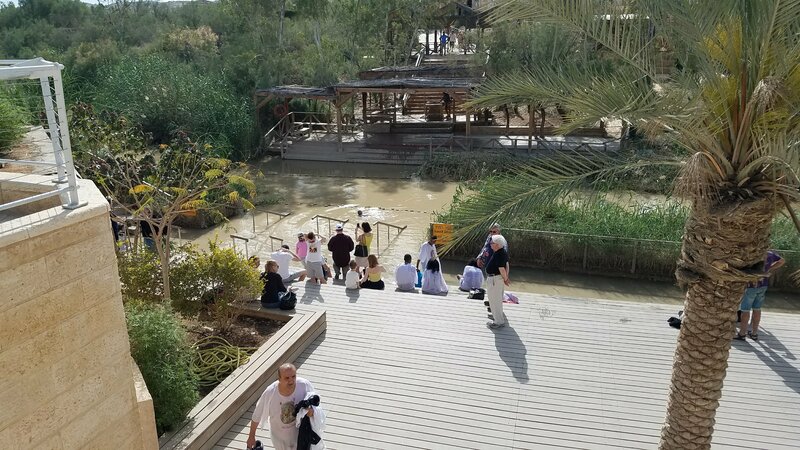 The river’s course has changed over the centuries, so that the actual site of John’s baptisms is now on the Jordanian side, a few hundred meters to the east of the current river, but it was very moving for us to visit the current site, as well. Thanks for sharing your experience!